Jonas Mekas, born in Lithuania, came to Brooklyn via Germany in 1949 and began shooting his first films there. Mekas developed a form of film diary in which he recorded his daily observations. He became the barometer of the New York art scene and a pioneer of American avant-garde cinema. Every week, from 1958 until 1977, he published his “Movie Journal” column in the Village Voice, conducting numerous interviews with filmmakers from all over the world. 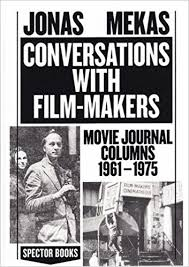 Conversations is the first time that these interviews with his filmmaker friends and associates have been put together in a book. Mekas recorded the conversations with his camera. From the films he shot with his interlocutors, Mekas selected one photo or still to introduce each interview. The collection of texts is supplemented by letters and extracts from related scenarios /scriptsand rounded out with an index of the people involved.